In 1899, Edward Stratemeyer founded the evil-sounding Stratemeyer Syndicate, a "factory" that produced children's books. He would hire writers through newspaper ads to write books according to idea and plot points that he mapped out. Why, one might ask? Because a writer eventually dies, leaving their series defunct and likely unfinished (obviously this was before VC Andrews, who can write from the dead). To avoid this, Stratemeyer theorized, one could simply hire a bunch of writers to write under a single psuedonym and the series could go on and on. Some of our most beloved children's series were produced under the Stratemeyer Syndicate: Nancy Drew and The Hardy Boys just to name two. Franklin W. Dixon was the designated psuedonym for The Hardy Boys Mysteries; but he was actually many authors including Leslie McFarlane, William Dougherty, and James Buechler. And, if you think these writers were the main creative force behind the books, think again: Stratemeyer, and later his daughters, Harriet and Edna, were the ones who plotted out the course of the books. My first question is, why bother with the psuedonym at all? It's not as if kids pay much attention to who the authors of their books are, especially when they're looking for "Hardy Boys." Just stick the name of the author for that book on the copyright page, take the author name off the cover, and no one would probably notice. Does there have to be an author for a book? Or do they feel the need to attach an author for credibility? Which leads me to my second question: does knowing these series were created by a corporate syndicate, and were mass-produced like those bagels you buy in plastic bags at the grocery store (eugh) change how you feel about them? I've never read Nancy Drew or the Hardy Boys, but I have to admit I'm a tad bit more leery of them now than I was. How about modern books that are produced the same way--Gossip Girl or Luxe, for example? 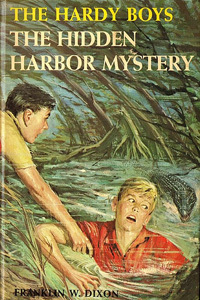 If you were a Hardy Boys or Nancy Drew fan growing up, what was the appeal of the series?